In a post/ad on Instagram, Cheyenne says “There’s nothing more important to me than my family – whether it’s eating healthy or spending lots of quality time outside, we’re always showing Ethan and Willow ways to take care of our whole health. “I have partnered with Cigna to remind the LGBTQ community that the body and mind are more connected than we think. Happy 4 year wedding anniversary my beloved @jasonrlandau. What a ride this life is with you. Since then, we’ve welcomed our magical Willow & Ethan into the world, we’ve said goodbye to our Dads, and we’ve weathered countless life adventures…good, bad, and everything in between. There is no one I’d rather be on this saga with. Onward we go my Jewish Prince. Cheyenne David Jackson was born July 12, 1975 in Spokane Washington, United States. He now lives in Los Angeles, California. Jackson is an actor and singer with prominent roles on Broadway, film and television. On Broadway, Jackson has had starring roles in productions such as “All Shook Up” (2005), Xanadu (2007), Finian’s Rainbow (2010) and “The Performers” (2013), among others. He appeared in the 2006 film, “United 93” and the 2014 rom-com “Mutual Friends”. On television Jackson has had guest roles on “30 Rock”, “Glee” and “American Horror Story”. Jackson has sold out Carnegie Hall for his concerts “The Power of Two” in 2010 and “Music of the Mad Men Era” in 2011. 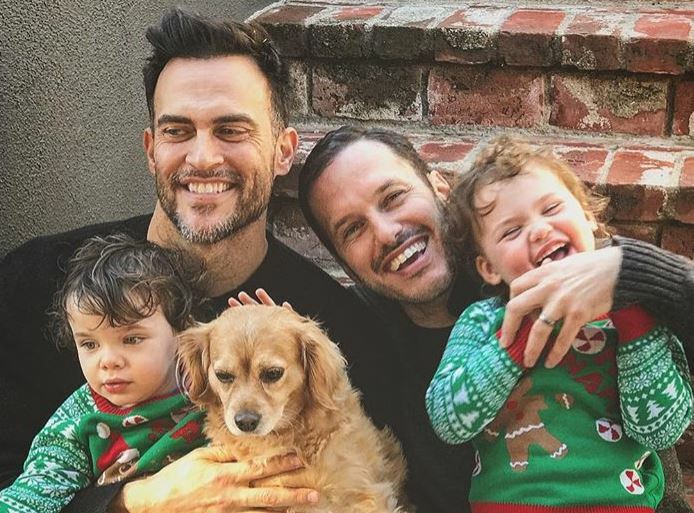 Cheyenne Jackson grew up in a conservative Christian community and came out to his family as gay at the age of 19. His mother recalls his coming out as a “difficult time” but feels they have “weathered it well” and grown as a family. Jackson began dating his husband Jason Landau in October 2013. The couple became fathers to twins in October 2016.